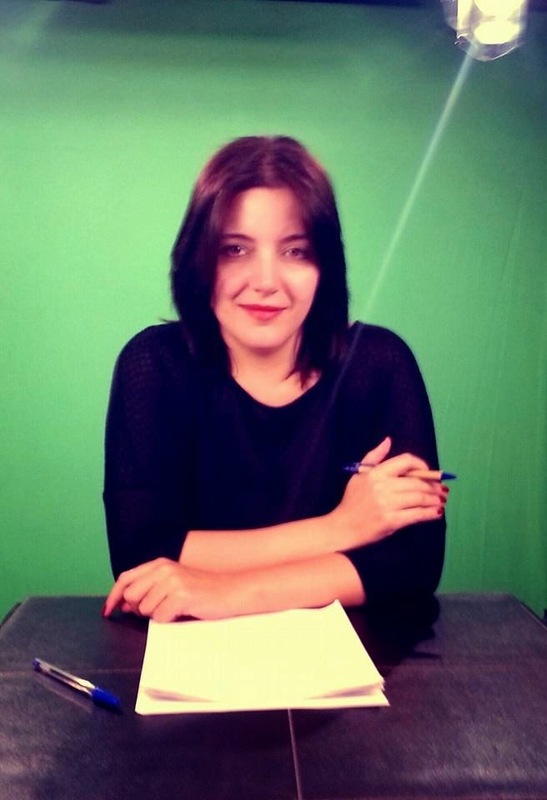 My name is Zeena Abu Al Saad and I am a Jordanian student studying journalism at the American University in Dubai. Despite being fully Jordanian, I have lived in Qatar for the full 20 years that I have been alive; I arrived in Dubai 3 years ago when I got accepted to AUD, and I am currently living here temporarily with my twin sister until we both graduate. Dubai being the great cosmopolitan city that it is, during the past three years it has not just introduced me to a great number of cultures different to mine, but it has also introduced to me a great number of opinions and perspectives on Islam much different to mine. As cliché as this may sound, my decision to become a journalist was initially greatly influenced by my need to defend my peaceful religion, Islam. The media to me is on of the most powerful creations of mankind, if not the most powerful; while I greatly believe that the media is super beneficial, I also believe that it is one of the strongest destructive forces on our planet earth. The title of the artwork that I have produced for my Islamic Art and Architecture course goes by the name Al Wihda Fi Al Tanawo’, which translates in English to The Unity in Diversity; despite being short, in my opinion, these two words capture the absolute essence of Islam and its Art. Why call it The Unity in Diversity? This project could not have come in a better time as we are currently in the midst of all the negative stereotyping against Islam and Muslims around the world. Through this artwork, I want us to come together to understand how imperative it is for Muslims to come back to the pluralistic vision of the Quran before anything. Islam-related issues in the media have changed significantly in the past 10 years, both in amount and quality. The occasions of September 11, 2001, pushed Islam into the worldwide media forefront: not just did coverage of Islam definitely increase, especially in news and entertainment media, however the way in which Islam is framed worldwide has also changed. The past couple of years and events have resulted in Islamic unfortunately being framed as a religion that is not accepting, not diverse, and not unifying. As a Muslim, I constantly feel the need to express the beauty of my religion and to help those who have been misguided, to see it for what it really is. Contrary to what is portrayed in the Media, Islam is actually a religion that shows that all individuals are totally equivalent in God's sight; Islam and the Quran are unmistakably accepting to diversity - in creation, society, and convictions inside of the human world. Disposing of the pre-Islamic tribal society instilling tight groupings in light of family and genealogy, the Quran portrays every single individual as a major aspect of one super unit, which is humankind. It addresses the totality of humankind as 'Bani Adam' (offspring of Adam). For instance the accompanying verse from the Quran supports the notion of diversity as a crucial component of the plan of creation. In verse 99 of Sura Younus, the Quran clarifies that on the off chance that it had been God's Will to not to give the freedom of choice to mankind, he could have made all humanity alike and all would then have Faith. Thus, the Quran endorses diversity and acceptance as a major aspect of the Divine Will. The Quran sees questions in the matter of religion as purposeless and urges its disciples to discover regular grounds of conviction through politeness, sympathy, and sincerity. There is a history of Muslims, Jews, Christians, Hindus, and individuals from different beliefs living respectively in congruity in a pluralistic culture under the Muslim rule; furthermore, it is important to take into consideration the remarkable ethnic and religious differences that existed in the early hundreds of years of Islam. This was obscure to different civilizations of those times. All Muslims from different origin used to live in flawless amicability with everyone else, as the Jews and Christians stayed faithful to their confidence and were completely free to satisfy their individual religious commitments. In fact, they wouldn't face any pressure regarding their faith or pressure to embrace Islam. The Prophet, for example, would take his partners and his hosts (of different religions) under his wings and would not permit anybody to embarrass them or to treat them cruelly. Furthermore, Jews and Christians embraced Arabic dialect and adequately added to the way of life of the Islamic culture. Back when Caliph Umar landed in Jerusalem after the success of the city by the Muslims in 638, the Christian Patriarch of Jerusalem gave him a voyage through the locales. As the timing for prayer approached, Umar requested a spot to pray. The Patriarch offered Umar the chance to pray where he stood in the Church of Holy Sepulcher. Umar turned down the offer saying where he, the main Muslim ruler in Jerusalem, would pray, his supporters would assemble a mosque and that he couldn't let that happen out of respect for the church and its worshippers. Therefore, he prayed outside on the street and today a mosque, called the Mosque of Umar, still stands opposite the Church of the Holy Sepulcher. This demonstrates Umar's admiration and respect for Christians and their religion. I could go on for days about stories from early Islam that demonstrate its compassionate nature if given the opportunity. Islam is a religion that encourages all Muslims to draw in sympathy, obtain learning, and acclimatize wisdom no matter the origin or creed. In its initial hundreds of years the Muslim civilization was the vanguard of human advancement since it was not hesitant to recognize truth and to secure learning from whatever source - Muslim or non-Muslim, past or present (House of Wisdom in Baghdad is a great example). Ali, the fourth Muslim Caliph and a profoundly worshipped figure by all Muslims, said that one ought to assess a talk in view of what it says and not who says it. As for Islamic Art, I could also go on for days. Islamic Art is of great importance to me because I come from a family of artists who have instilled the soul of Islamic Art in my upbringing. When many of us think of Islamic Art, we think of The Dome of The Rock, The Taj Mahal, and maybe bowls or silk carpets, but these are just examples; what exactly is Islamic Art? Through this brief description of Islamic Art that I will be presenting, I will also further emphasize just how diverse and unifying our religion is, even in its art. Islamic Art is a concept put together by art historians in the nineteenth century to order and study the material initially delivered under the Islamic groups of people that rose up out of Arabia in the seventh century. Today Islamic Art depicts the majority of human expressions that were created in the grounds where Islam was the prevailing religion or the religion of the individuals who ruled. Unlike the terms Christian, Jewish, and Buddhist workmanship, which allude just to religious craft of these beliefs, Islamic Art is not utilized only to portray religious art and architecture, yet applies to all fine arts created in the Islamic World, both religious and secular. Therefore, Islamic Art alludes not just to works made by Muslim specialists, artisans, and designers or for Muslim supporters; It incorporates the works made by Muslim craftsmen for a supporter of any faith, including Christians, Jews, or Hindus, and the works made by Jews, Christians, and others, living in Islamic lands, for patrons, Muslim and so on. A standout amongst the most popular landmarks of Islamic Art is the Taj Mahal, situated in Agra, India. Hinduism is the prevailing religion in India; nevertheless, due to the fact that Muslim rulers, most broadly the Mughals, dominated extensive regions of current India for a considerable length of time, India has a boundless scope of Islamic art and architecture. Furthermore, another example of the diversity of Islamic Art is The Great Mosque of Xian, China. Initially developed in 742 C.E., the mosque's present structure dates to the fifteenth century C.E. Moreover, it takes after the arrangement and engineering of a contemporary Buddhist sanctuary. Islamic Art is not a monolithic style or development; it traverses 1,300 years of history and has mind boggling geographic assorted qualities—Islamic domains and administrations controlled regions from Spain to western China. In any case, few if any of these different nations or Muslim realms would have alluded to their craft as Islamic Art. An artisan in Damascus would have thought about his work as Syrian or Damascene—not as Islamic. While taking other courses in AUD such as Arts History, I have come to realize that in a few ways, Islamic Art is somewhat like the Italian Renaissance. Amid the Renaissance, there wasn’t a one unified Italy; it was a place of many independent city-states. Nobody would have thought about one's self as an Italian, or of the craftsmanship they delivered as Italian, rather they perceived themselves as a Roman, a Florentine, or a Venetian. Every city created its very own local and astounding style; In the meantime, there are sure hidden subjects or likenesses that bind together the craftsmanship and design of these urban areas and permit researchers to talk about an Italian Renaissance. The artwork I have produced is highly influenced by a painting called diversity that belongs to a contemporary Muslim artist Siddiqa Juma. According to her website, as her style has developed, she has become focused on Hajj, the journey that each Muslim attempts to perform in any event once in their lifetime. Juma has not yet made this voyage herself, thus her work conveys not the experience of journey or the procedure of performing the Hajj, however a longing to leave on that trip, with every one of the components on each canvas floating overwhelmingly towards the heavenly city. This longing has given her work another focus, moving her far from impersonation of exemplary Islamic art and towards a more individual style, one that conveys at the same time the closeness and the separation between Juma and her religion. One of her paintings, named diversity, which stood out to me the most, portrays the Kaaba surrounded by small blotches of many different colors, representing the diversity of Islam and its followers. I wanted to create something that, similar to Juma’s work of art, represents the diversity and unity of Islam, but in a different way. My artwork was created using acrylic paint on a simple white rectangular canvas. I began by first using a paintbrush to paint the entire canvas black, and then I proceeded to add handprints, using my own hands, in many different colors. The handprints on my canvas in different colors are there to symbolize the diversity of Islam as a religion, its acceptance to diversity, and the diversity of Islamic Art (Islamic Art is marked by handprints of people of all colors, religions, and cultures.) Furthermore, I also used this technique to emphasize the notion of unity in Islam; the different colored handprints, which are meant to represent a variety of humans, are united together on one canvas. The colors I chose to place on my canvas are symbolic in Islam; for example, I chose the color green because it is the dominant color in Islam and it represents the notion of paradise, I chose to include red because it symbolizes passion, white symbolizes purity and peace, and finally blue symbolizes the sky (where god and heaven meet). Following this, I outlined my handprints in colors different to those they are in just to create the illusion of contrast to add a wider range of colors to the canvas. Furthermore, I also added blotches of different colors of paint by gentling dabbing a small sponge on empty areas of the canvas. I chose to add calligraphy because it is an essential work of art in the Islamic World. The Qur'an, written in rich scripts, speaks to Allah's (or God's) divine word, which Muhammad got specifically from Allah amid his dreams. Furthermore, Quranic verses, executed in calligraphy, are found on a wide range of types of workmanship and design; Islamic calligraphy can be found on everything from fired dishes to the dividers of houses. 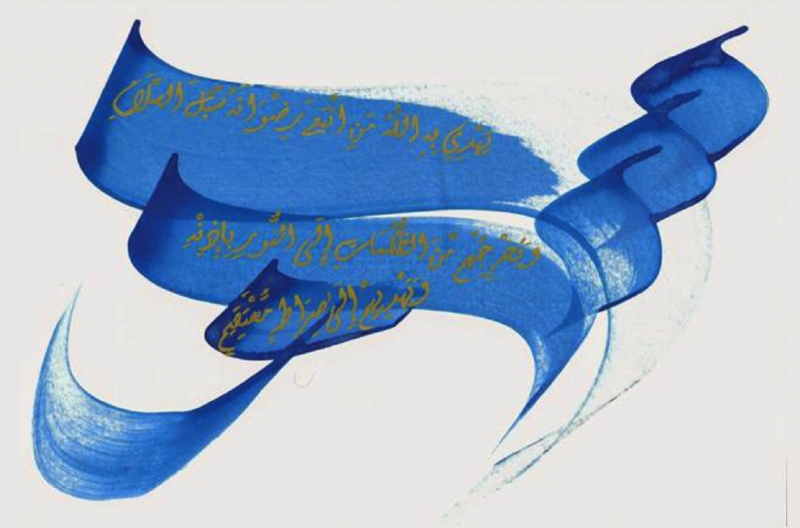 Calligraphy's inescapability underscores the quality and importance that Islam places on dialect, particularly Arabic. I chose to write the word Salam in white; Islam is directly linked to the word “salam”, which translates to peace in English. By using the color white, I wanted to further emphasize the meaning of the word and its importance in our religion. In conclusion, through this artwork I feel the need to shed light on three of the most fundamental parts of Islam, which are peace, unity, and diversity. Islam is not about war and slaughter and scorn like what the vast majority thinks, due to images shaped by the media. Islam is not about murdering and lying and doing repulsive things "in the name of Allah." Islam is not about telling the world that non-Muslims shouldn't be alive. Our religion is about both internal and external peace, accepting diversity, and uniting the world and creating one Uma (community).